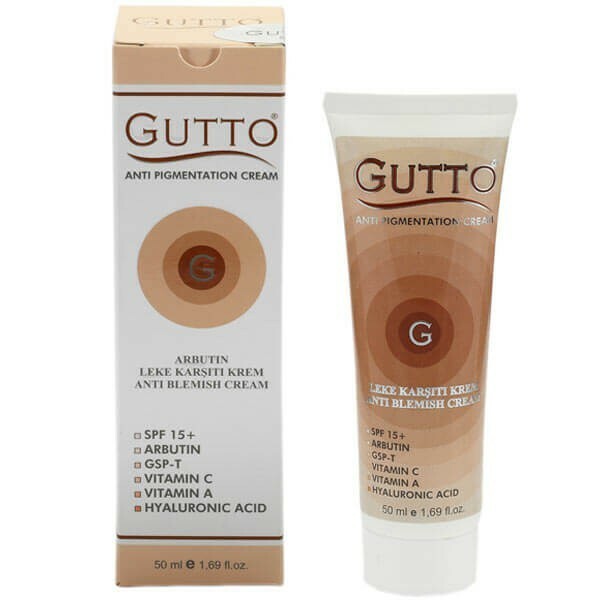 Gutto SPF15+ anti-pigmentation cream attenuates the brown spots of the skin. With a solar index of 15, it prevents future spots that can form by the sun. Gutto depigmenting anti-stain cream SPF15 + is a complex of vitamins that prevents the formation of brown spots on the skin and reduces existing stains thanks to the synergy of precious vegetable oils, arbutin, hyaluronic acid it contains. This skin remedy with natural active ingredients is a restorative cream that fights against all imperfections of the skin, blurs unsightly marks such as age spots, sun spots, acne scars or other skin problem. As a peel, the Gutto anti-stain treatment prevents skin aging and corrects all kinds of pigmentation defects. The spots will be faded, the blackheads and acne problems reduced and the skin will be as clean as after the use of a foundation. The anti-aging and anti-imperfections actions will restore to the skin a radiant complexion and a natural beauty. Apply Gutto cream morning and evening, on the face or body after cleansing the skin. Avoid the eye area. Avoid the sun after applying the cream.